This cheap sampler includes five of our most popular fruit-flavored e-liquids! great flavor & a fair price! My wife can be indisisive so I got this pack so that way she could try multiple things in one order. I thought it was priced good and the bottle came in a decent size. 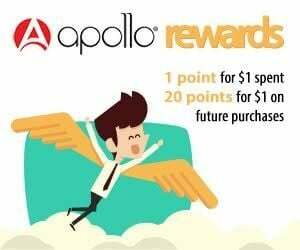 First time ordering from Apollo. All of the flavors were incredible. I have never tried good quality low priced juice like this. And it's made in California! Customer service was a pleasure to deal with and easy to talk to. The grape flavor really is good. I got this one because I haven't tried any of the fruit flavors before. I liked the Watermelon and Green Apple flavor too. Both tasted soooo smooth which sometimes the 50/50 can be kinda harsh but these were not harsh at all. I'm gonna get the bigger size next time. I like the smaller size bottles for traveling and because they are easier to use. The bigger bottles are too hard for me to squeeze. I wish they were not but it is okay because I have gotten used to the small size bottles. I like the grape flavor the best. that one I use all of the time.